Here comes the most dreaded part of every book talk: the things I didn't like. Of course there are some - every book has pros and cons. 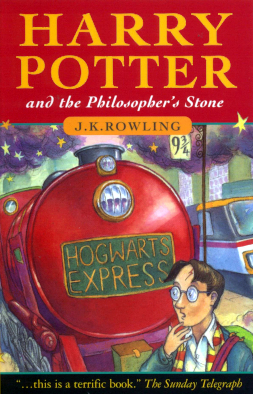 In this book, I think so much time was used to describe Hogwarts and what was happening in a broader timespan ('the winter came and the lake froze,' etc.) that there wasn't really much dialogue. I loved the characters so much, though, and I think more dialogue would have helped bring them to life a little more (not that that didn't happen.) I also think the book took quite a while to get to the actual adventure part. Most of it was describing Hogwarts and Harry's journey there. But that wasn't bad either, to be honest, because I really loved Hogwarts and liked learning about it and everything. It seems so fantastic! I want to go there! I'm going to give this book 5 stars. It was honestly phenomenal, and one of the best books I've read in a very long time. This might even be tied with my all time favourite book, Divergent. I'm so incredibly excited to finish the second one! I also recently re-watched the movie of this book, and was amazed by the likeness. Lots of lines were exact quotes from the books, which is pretty great! I really loved both the book and the movie, and I would definitely recommend it to people of all ages. Leave a comment below of what you thought of this book, or if you're planning to read it! (Book recommendations are also always much appreciated!) Thanks for reading!